In Candy Crush Jelly level 119, locate the correct amount of Pufflers and where they are hiding. These Pufflers are flump-like marshmallow caterpillars hiding underneath frosting. The majority of the times the Pufflers usually hide at the bottom rows of the gaming area. Try to activate horizontally striped candies at the bottom rows of the playing field so as to clear the Pies and the frosting since it is the fastest way to clear the blockers. Revealing part of the Puffler forces it to hide somewhere else by quickly moving to another region within the playing field. Exposing the whole Puffler collects it. 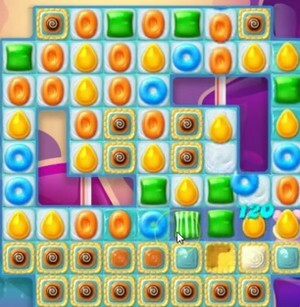 In Candy Crush Jelly level 119, to find Pufflers, embrace a technic of eliminating the frosting first, before focusing on the spreading of jelly across the gaming area. Are you more of a visual learner? Watch this gameplay video for Candy Crush Jelly Level 119 to help you beat the level. Notice the different strategies this player uses to improve your Candy Crush Saga game.